The Facebook page for the Latin Mass Society in Australia posted an amazing video about a month ago that has since gone viral (you can watch it below). The chant they are singing is called Salve Regina, and you can find both the Latin text (which they are singing) and an English translation here. FSSP stands for Fraternitas Sacerdotalis Sancti Petri (in English: Priestly Fraternity of Saint Peter), which is a group of priests in full communion with the pope who celebrate the Extraordinary Form of the Mass and otherwise live more in accord with older, traditional Catholicism. 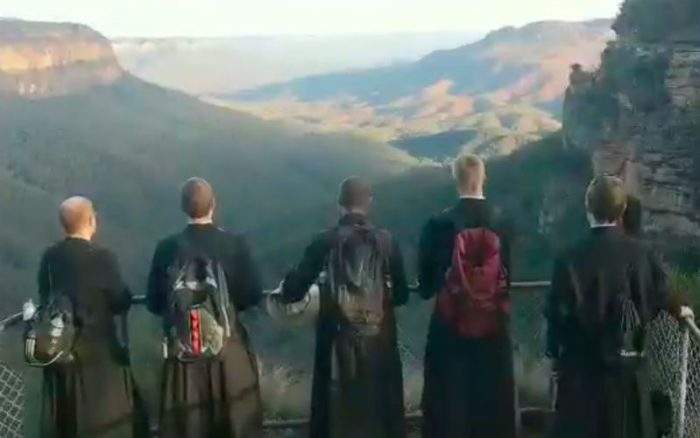 As you can see in the video, the Blue Mountains are a very picturesque range, located not far from Sydney!